Breakfast by the pool is boring now because why have your breakfast by the pool when you can enjoy it inside! With the rising trend in many luxury resorts around the world, we decided to bring you fantastic roundup of gorgeous resorts and hotels in Bali for you to have breakfasts right on top of your pool. Check them out! Samsara Ubud is a luxurious haven for those who seek an authentic Balinese experience that is at harmony with nature. Start your day in style and indulge yourself to an unforgettable floating breakfast experience at the comfort of your private pool overlooking the lush tropical jungle. Samsara Ubud will serve you with fresh fruit juice, fresh bread basket and for the main breakfast selections, you can choose their signature lobster and egg. 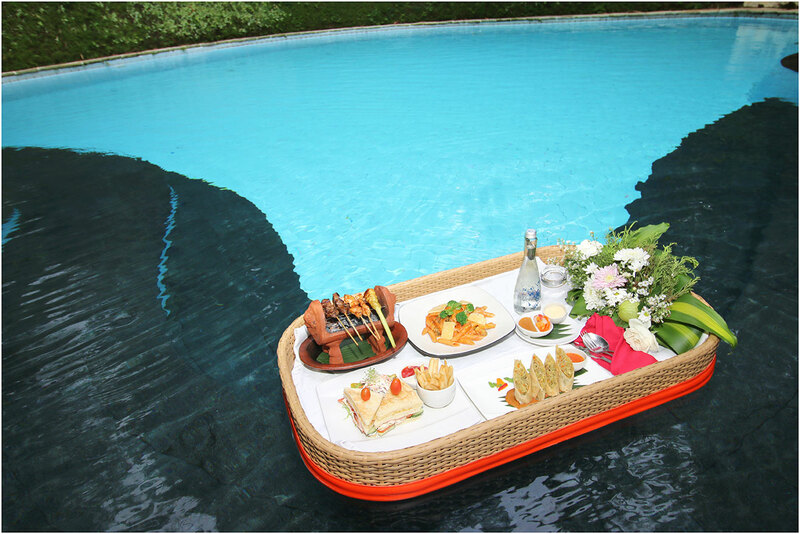 Not only a fantastic all-inclusive resort, Ayana Resort and Spa Bali’s signature floating breakfast will start your day in an unforgettable way. 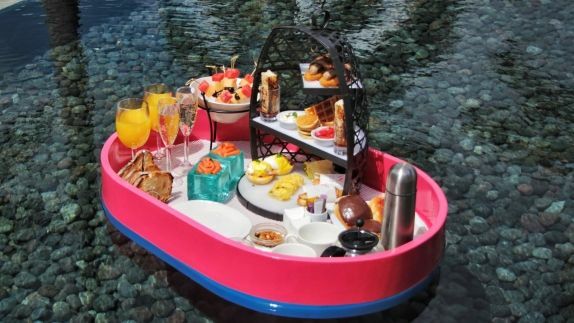 Order up their floating breakfast where you will be served breakfast on a floating tray in your own private plunge pool. Their butler will then set sail the three-course gourmet breakfast with the accompaniment of your favourite coffee, tea, juice or a chilled bottle of Champagne. The Royal Purnama will serve you fresh fruit juice, fresh bread basket and for the main breakfast selections, you can choose from eggs benedict, mixed omelette served with sausage and bacon, indonesian fried rice to noodles. 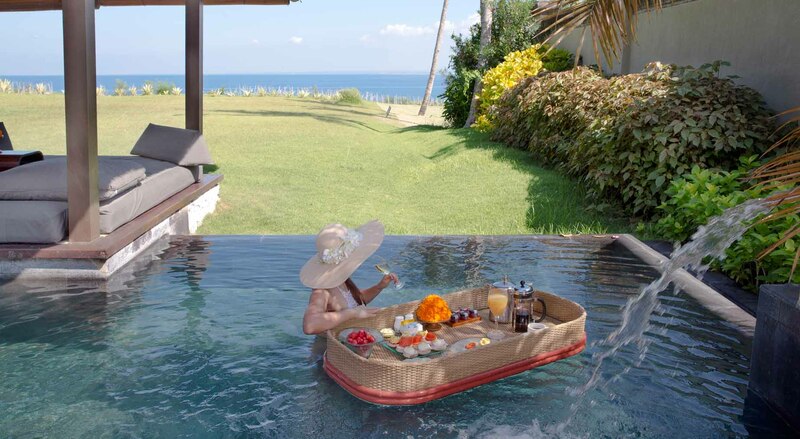 Their floating breakfast comes with two options: with or without Valdivieso Brut. So, take your pick! Start your day in the paradise island of Bali with a unique breakfast while relaxing in the comfort of your private pool at Kamandalu Ubud. Order up their floating breakfast and wait while the staff serve your preferred breakfast selections complete with a bottle of sparkling wine. If you are a honeymooner or a couple wanting to enjoy a unique breakfast experience, this is the ultimate indulgence for you. Slip into your swimwear and enjoy a breakfast while overlooking the beauty of Ubud’s terraced landscape. Kupu Kupu Barong Villas & Tree Spa by L’Occitane offers a different experience for guests private plunge pool as they let you swim around in your private pool, or the main pool, while enjoying a selection of American breakfast or Indonesian breakfast. The combination of unique floating breakfast and stunning morning scenery from your villa will surely create a wonderful experience. A fun and luxurious resort, W Hotel Seminyak provides guests a bubbly morning dip along with their signature floating champagne breakfast. Bubbles and breakfast, what more can we ask?